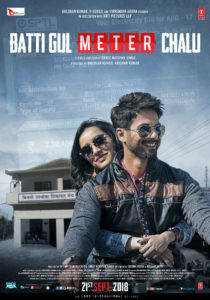 The forthcoming social drama film Batti Gul Meter Chalu starring the ever popular Shahid Kapoor (of Padmavat fame) together with Shraddha Kapoor and Yami Gautam will be releasing on 21st September 2018. Plus the beautiful first song sung by Atif Aslam has had a phenomenal response world over. The film is produced by Bhushan Kumar, Krishan Kumar, Shree Narayan Singh, Nitin Chandrachud, Kusum Arora and Nishant Pitti and directed by Shree Narayan Singh.